Warning: This report contains details that some might find disturbing. 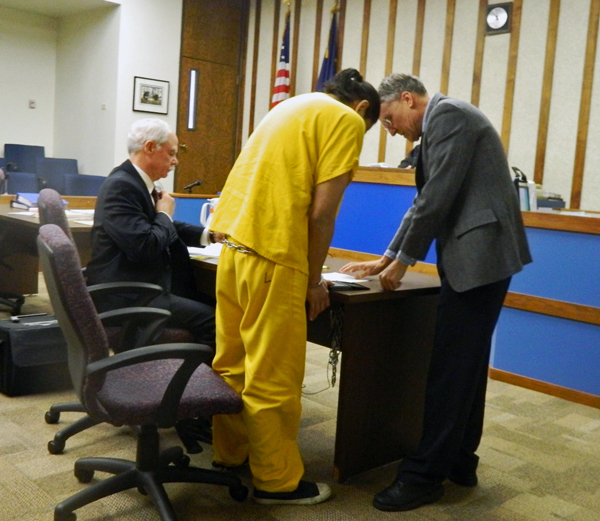 On Thursday, a Ketchikan judge sentenced 30-year-old William Buxton to serve 60 years in jail for the murder of his aunt, Leona Meely, during an argument a little more than a year ago at the family’s home in Metlakatla. In June, a jury found William Buxton guilty of first-degree murder. Although there was evidence that the defendant was mentally unstable at the time of the killing, his defense team did not try to claim legal insanity. During the sentencing hearing, though, defense attorney Sam McQuerry called up a forensic psychiatrist who has examined Buxton, reviewed the case notes and listened to recordings from the trial. Mark McClung has diagnosed Buxton as schizophrenic. During the June trial, several witnesses testified that immediately after the killing, Buxton talked about shadows only he could see, said he was one of the four horsemen, and that he was concerned about a “globe” in the hallway. He also said he heard piano music from under the house, and believed that his aunt was practicing witchcraft. McClung said he believes that Buxton’s mental illness was the major reason leading to the attack on Meely. The expert also testified that in Washington state, where McClung practices, Buxton’s mental condition meets the legal definition for insanity, but Alaska’s definition is much narrower, so he couldn’t use that defense during the trial. In Washington, there also are programs for people with schizophrenia who have committed violent crimes. The primary treatment is medication, which can reduce the symptoms. McClung said Buxton briefly took anti-psychotic medication while incarcerated, and it seemed to help. But then he stopped taking the drugs. “He had chosen prior to our February evaluation to stop taking the prescribed medication because he thought they made … his mind fuzzy,” McClung said. That is a common complaint, McClung said, and there are additional medications that can reduce side effects. But another problem with schizophrenia is that people who have it don’t believe that there’s anything wrong with them, so they don’t see the need or benefit of medication. Based on McClung’s testimony and diagnosis, the defense essentially asked the judge to consider a combination of jail time and treatment, with a “step-down” program that would reward Buxton for complying with treatment. For example, if he takes his meds willingly for a certain time frame, he is rewarded with somewhat more freedom. McClung talked about various programs in Washington state that provide those options. But, District Attorney Steve West asked for the maximum sentence of 99 years in jail, with 75 to serve, reminding the court that this is Alaska, not Washington; and that Buxton was found guilty of intentional murder. West also noted that two mental health professionals in Anchorage did not agree that Buxton has schizophrenia. McQuerry agreed that the killing was a horrible tragedy, but he urged Superior Court Judge Trevor Stephen to consider rehabilitation as the primary goal when deciding on the sentence. “That step down process is a recognition that Mr. Buxton recognizes that he has a mental illness and he’s willing to comply with a treatment program that will allow him to behave in an acceptable manner,” McQuerry said. Stephens asked the family for a statement, and Buxton’s sister, Nyree Buxton, got up to speak. Buxton did not make any comments. Following the testimony and statements, Stephens took an approximately 15 minute break before issuing the sentence, and during that time, Buxton stood and visited with his mother and sister. They talked quietly, sharing family news, before the judge returned and announced the sentence. While agreeing that Buxton likely does have schizophrenia, Stephens noted that the offense was very serious, and Buxton’s rehabilitation is not the judge’s primary goal. That said, if Buxton is released on parole, Stephens ordered mental evaluations, and compliance with treatment programs.